Scotland NC500 day 7 - 90 miles John O'Groats to Rogart. The forecasted wind and rain comes in during the night. I wake to the tent flapping and ask the universe if it could be so kind as to not cast anyone of us into the sea. Morning comes with all campers and all bikes still safe and upright. Campers are hardy types, well we have to be. We have been lucky on this trip thus far, managing to both pitch up and decamp in the dry. So this morning's rain though unwelcome has not deflated spirits. Therefore the consensus on the weather as we all pack up is that it is...fairly dry and rather bracing. This sounds much more positive than wet and windy. We decide to ride along with Nick's group today. Nick is on a 250cc like myself, although a Herald not a Kawasaki. Marina is also in this group and is riding her 125cc scooter. It is a sight to behold watching this gutsy lady on L plates tackle the NC500 with no fear and certainly enough oommpphh on her 125cc. More mustard than a mustard seed that girl. The mountains have been left behind along with the dry weather. There is no let up to the rain today. The coastal route may well be quite pretty in the dry. However it is difficult to see much through the grey mist and my rain splattered visor. 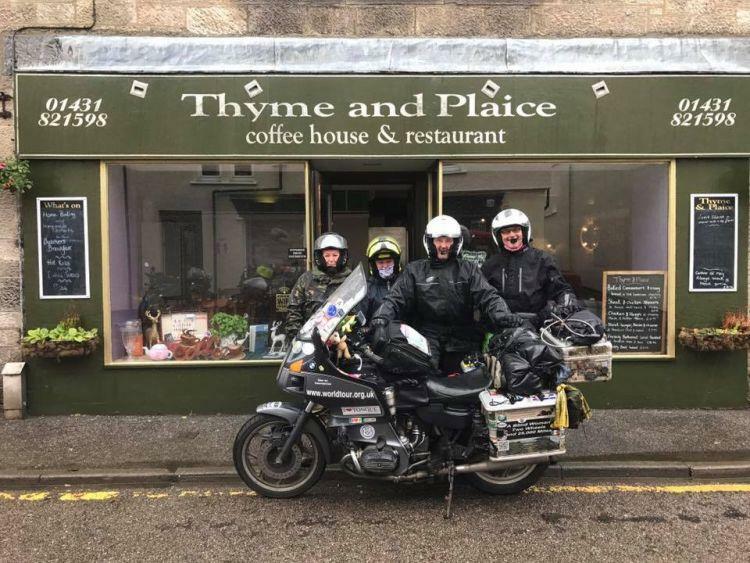 Relief from the rain is provided by a lovely breakfast in the charming Thyme and Plaice in Helmsdale. 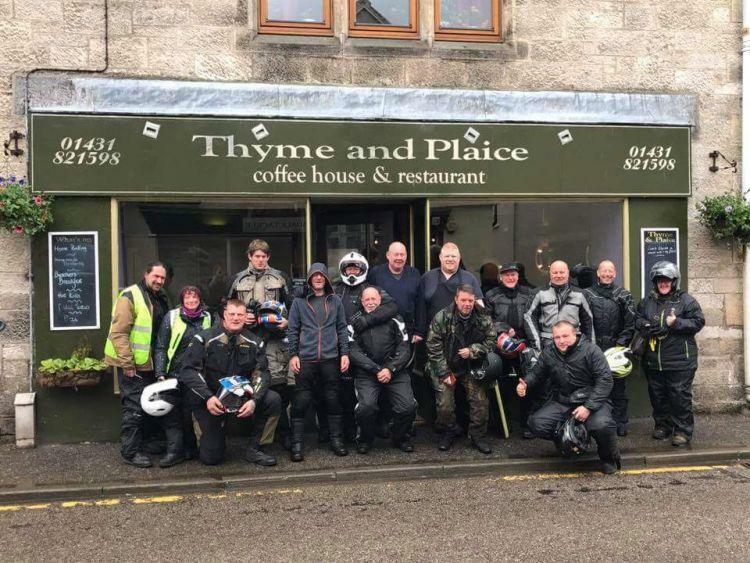 Most of The Noo 2 riders have decided to come here en masse so it is a little cramped inside but it is fun to all catch up and have a chat while our clothes makes puddles on the floor. Our friendly host Robert is a fellow biker so no dirty looks for the wet floors here, just smiles and understanding. We follow the hearty breakfast with a short walk around the harbour in the rain to burn up some bacon calories and it is then back onto the bikes. We ride on through the rain and oh no what is this feeling I have in my toes? Surely not, how can this be? I have not had this feeling in a long time but there is no mistaking it now. I have the most unwelcome affliction of a soggy foot. My trusty Daytona Lady Star boots, or rather boot, as one remains dry, have finally sprung a leak. Nooooo!! The persistence of the Scottish rain and the thousands of miles of gear changes have finally taken their toll. This in a most unexpected occurrence and I really did not wish to have to remember how horrid wet feet are. We have another stop off at Dornoch (pronounced DoorKnock). We have a little walk around or rather a squelch around in my case. Sanctuary from the rain is found within the town's Cathedral. A kindly gentleman is happy to chat to us all and imparts his knowledge about the history of the Cathedral and its stained glass windows. I am not religious, as in I do not have a particular faith. I do however believe in something greater than ourselves. I like churches, they initially make me feel at peace when I enter one. 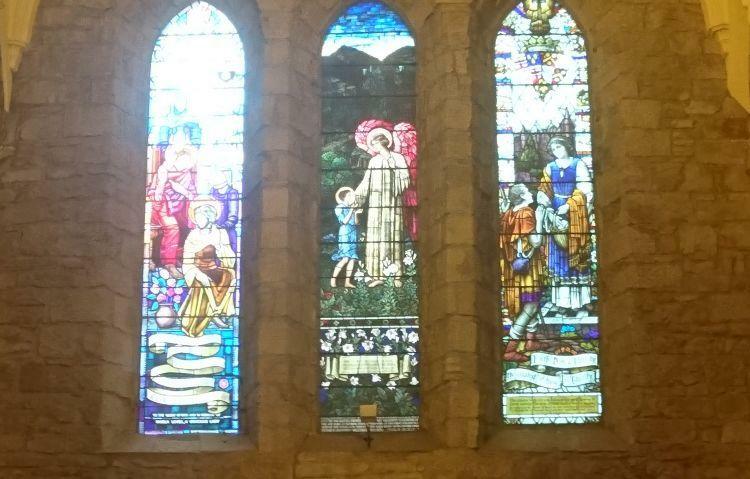 But then I begin to think of the history of the church and the atrocities that have been committed and are still committed today in the name of faith and then I feel unease. I believe that at its core the original purpose of faith and its churches was pure, it is the people that have inhabited them that has been a problem at times. Faith can be a wonderful thing and equally a monstrous one. No I can never quite reconcile my feelings about religion and its buildings. We do thank the informative gentlemen for his time before once again braving the outside as the heavens still have more tears to fall upon our bowed heads. 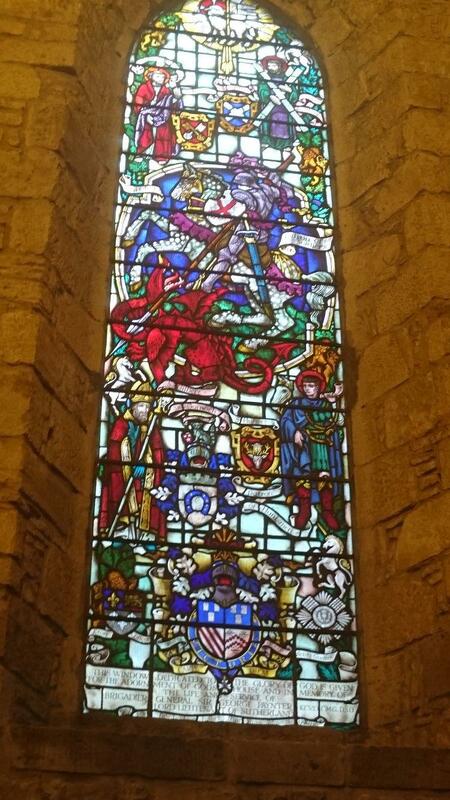 The Cathedral's beautiful stained glass windows are all sponsored. A rather grand looking cafe across from the Cathedral provides refreshments and a chance to drip on some more floors. I always feel a little uncomfortable creating a small lake around myself and I am sure it is not appreciated by the cafe staff. There is nothing I can do about it other than mutter an apology for the puddle as I depart. There is a light at the end of the tunnel or rather there is promise of dry at the end of the wet. For tonight we are going upmarket. No camping tonight for us we are having a night in a hostel instead. But this will be no ordinary hostel either. 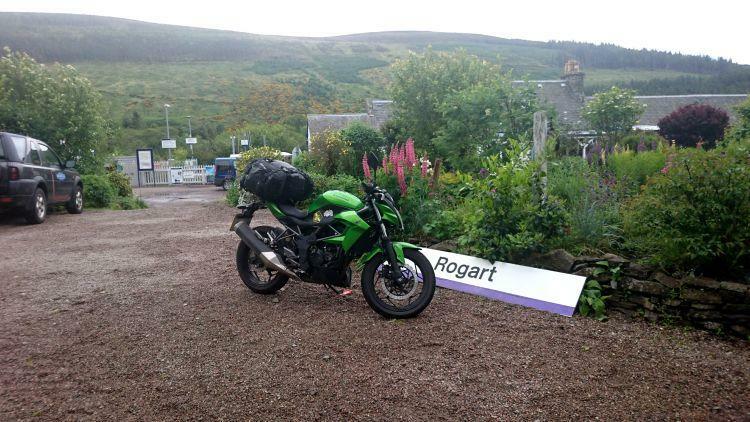 Sleeperzz is in Rogart, the hostel is based beside a working railway station. 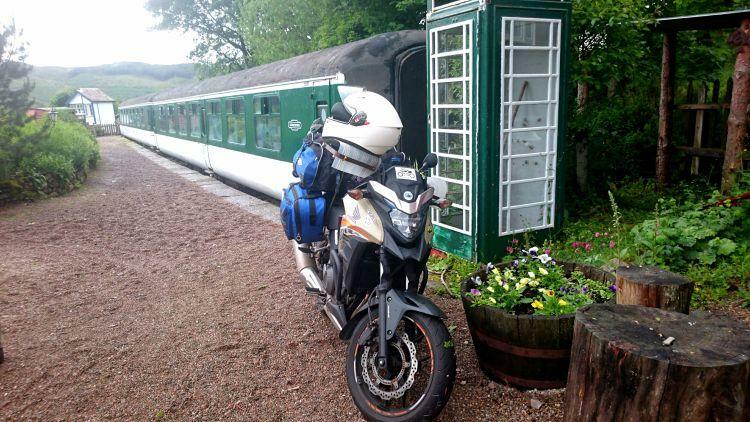 Its accommodation consists of railway carriages, a showman's wagon and a B&B studio apartment. Nearly the whole of The Noo 2 crew have booked places here for the night. The standard price for the shared carriage is £19 a night. However that was all booked up by the time Ren and I tried to book so we had to go and upgrade even further. The Strathisla is a self contained carriage with its own bedroom, living room kitchen and bathroom. It is also £27.00 per person per night. Way over our usual budget but it is our little bit of fun and luxury for the trip. As the rain continues I ride on looking forward to being able to dry out once we get to Rogart. It is quite easy to cope with intermittent rain. The breaks in between give you time to dry out and relax a little as visibility improves and the roads dry out for better grip. However all day long rain without any breaks can become most wearisome. My wet foot is also getting on my nerves. We finally reach Rogart and pull into to Sleeperzz. The car park consists of thick gravel. I do not like the look of it and I really hope I don't drop the bike. I gingerly edge the bike in and park up successfully, phew. The setting of the carriages is quite delightful. The rolling hills provide a wonderful backdrop to the charming gardens with abundant lupins and other plants. It may be wet and miserable but this quirky place has brought a smile to my face. The Showmans Wagon will be housing our own showman Bernard tonight. After some confusion over which carriage is which I find our carriage further along. 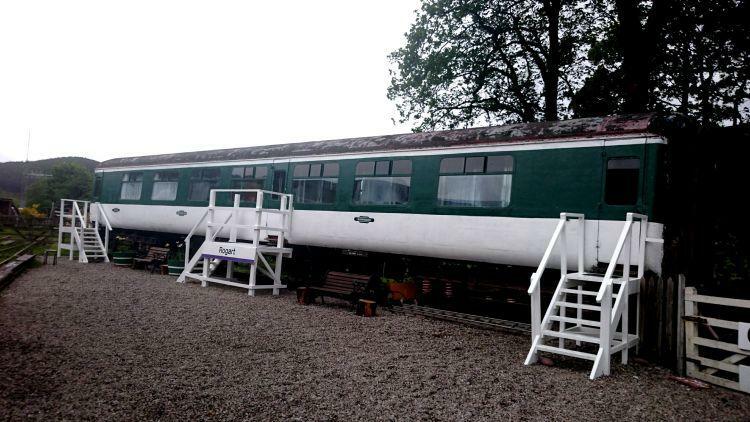 Our "Posh" first class carriage is one carriage divided into two self contained accommodations. You shall be mine, well one half for one night that is. 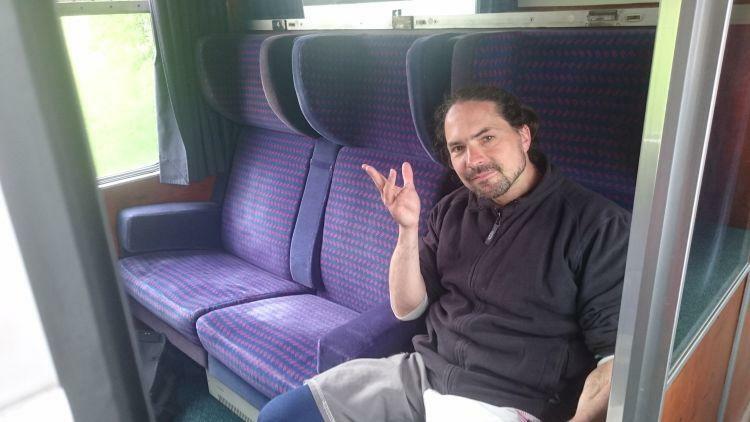 Now do not forget the carriages are classed as hostel accommodation. 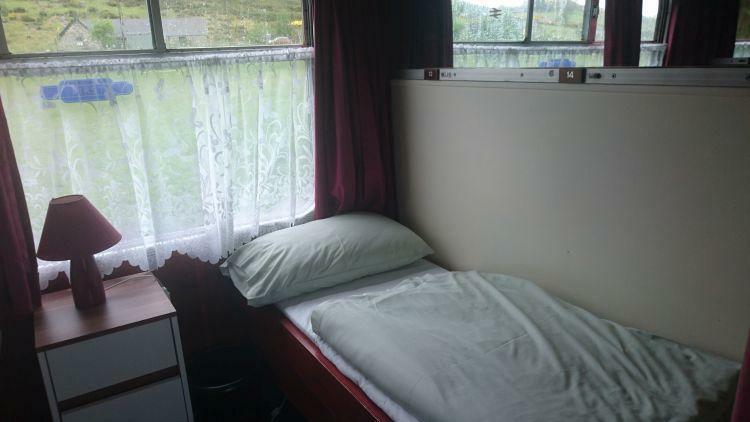 One of the carriages provides shared accommodation. 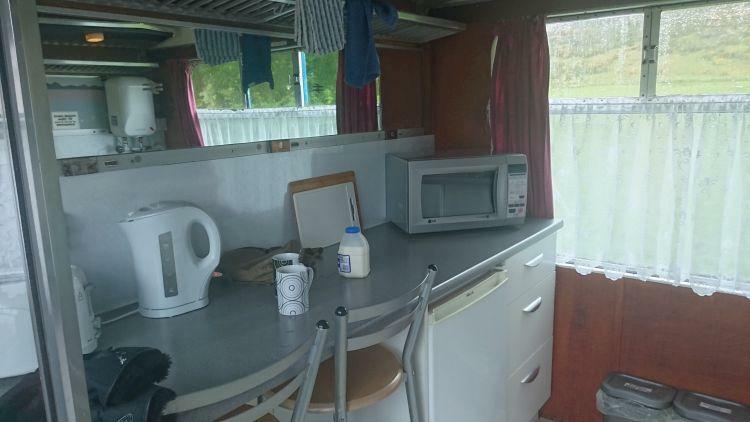 It has shared bunks, living room, kitchen and toilet facilities. 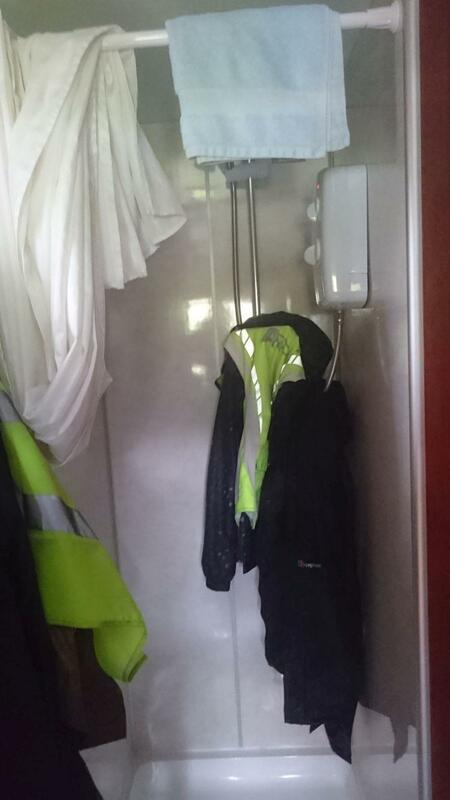 It also has a fantastic drying room that is soon filled to the brim with dripping wet bike gear. 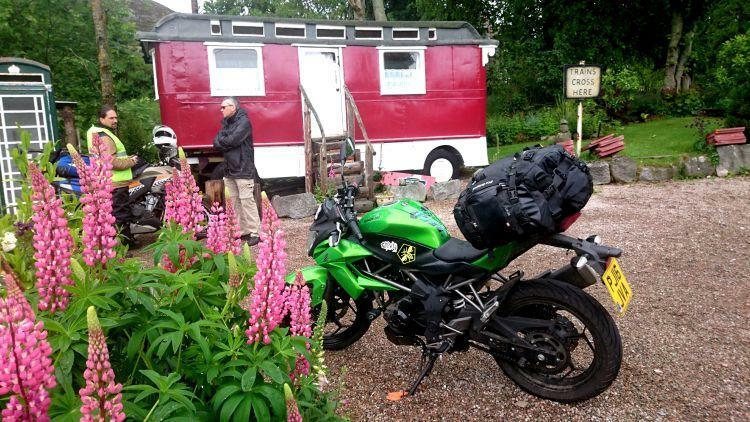 Our carriage is self contained and though quirky and certainly different it is not luxurious. So do not be expecting luxury down pillows and Egyptian cotton sheets with Laura Ashley furnishings. It does however feel luxurious to two weary and wet bikers who's usual holiday accommodation is in a tent. We can stand up and move around. 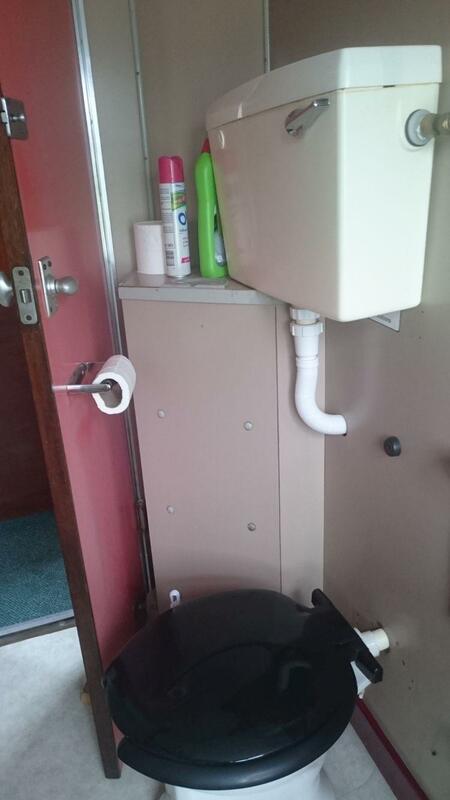 We have a shower and a loo to ourselves. We have a kitchen to cook in and a living room to sit in. We also have heating...ahh bliss. With a toilet and a kitchen we can drink as much tea as we want tonight. With thee shower thee be clean and thee bike gear thee be dripping. Ren finds happiness in a seat to call his own. No double bed just two singles. Oh well we shall just pretend to be teenagers again. The living room also provides a bookshelf brimming over with books. As a librarian I am delighted and eagerly scan the titles on offer. Oh, every book is about trains, nothing else just trains. Haa well I guess it is fitting. This place would be a train spotters dream. 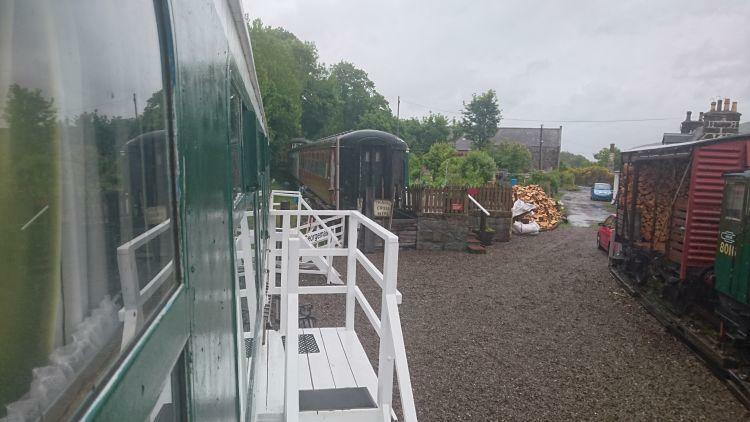 You could stick your head out of the carriage to watch train pass by on the Rogart line and then snuggle up in a carriage while reading about trains to your heart's content. Not being avid train spotters ourselves Ren and I choose to chat to David and Neil our fellow Noo riders before we all go to the local pub. We spend a great evening eating, drinking and making merry with all of the Noo 2 riders. One of the the group takes a photo on his phone and then asks if there is a WiFi signal. The pub goes deathly quite...what mystery and magic does this stranger speak of??? I wonder if we are all about to be thrown out for practising some kind of evil witch craft. The deadly silence continues, is this it, will we all be tomorrows burgers? A great guffaw by the barman finally shatters the silence quickly followed by loud raucous laughter of the other locals. Err I guess that'll be a no to WiFi then. We learn later through hushed whispers that there is an old disused telephone box in the village. Apparently if you sneak in there with your new fangled magic phoney thing and stick you tongue out and hold you leg at just the right distance from the ground, sometimes just sometimes a magic may occur that is called a signal. I spend most of the evening releasing balls...stop it I know where your mind is going. Snooker balls see, I am too shy to play a game in front of a crowd, especially as I have no clue how to play it anyhow. So I like to take part by being the ball girl. Dawn does us girls proud by beating some of the boys. Neil who is a big lad with huge hands cripples a few other competitors in his handshakes and has us all in tears laughing. He brings tears to Bernard's eyes of a different kind when he grips his thigh. I think Neil may need to classify his hands had deadly weapons. It it soon time for bed and this is where some of us will part. We may not all see each other in the morning so we say our goodbyes now. What a smashing bunch of people I have had the privilege and honour to meet on this trip. The Noo 2 group has brought strangers together. Thanks to Nick organising this trip strangers have become friends and already established friendships strengthened. We have all gathered small snapshots of other peoples lives to take away with us and store in our happy memories banks. By the simple act of talking we have exchanged laughter and comfort, ideas and inspirations. Our world can sometimes feel a lonesome place. Surrounded by a thousand people none of whom we speak a single word to. I am therefore grateful for every word shared on this trip. For the blue people who I some how know will become special to me and to everyone else that I now wave goodbye to tonight with fond farewells. Thank you each and everyone for your company, for giving the most precious gift of all, the gift of your own time. As I walk hand in hand with Ren back to the only first class accommodation I may ever stay in I know I am rich in so many more ways than money. I am rich in memories, packed to the brim with lochs and mountains, friendships and laughter, exhilaration and love. Travel as they say does indeed make you richer. I stopped there one night on my 1990s tour of northern Scotland (before it was the 500). It was a very weird place then. The only accommodation I could find was a very scruffy B&B with nylon sheets that caused static electricity shocks, and an extremely odd landlord. And me being used to Logis de France and the like. Anyway, the only place open was a little restaurant which was totally Cartland themed - pink frills everywhere, menu with tasty items like "Rippling mussels on a bed of silken tagliatelle" etc. (I may have made that up but you get the drift). The romantic novelist theme extended to the maître d' who, although sporting a full beard, was dressed in a flouncy turn-of-the-century lacy dress. The effect was slightly spoilt by the mat of ginger chest hair sprouting out of his cleavage. Actually the food was OK. Early the next morning, in an attempt to escape the B&B landlord, I made an early visit to the town's tourist attraction which was a small museum depicting the Highland Clearances. This should have been a very poignant visit but it was somewhat marred by the primitive animatronics that looked as though they had been made by primary school children given a lifetime's supply of sticky backed plastic and toilet roll inners. It sounds as though the place might have improved since my visit. We only stopped at the cafe for a big bite to eat then wandered around the harbour for 20 minutes. We can't comment on the museum, the B&Bs or the restaurants. Having taken a brief walk around I thought Helmsdale looked quite pleasant. While your experience may have been a little surreal Ian it did at least provide an interesting and curious memory for you to recall. Strange is at least better than dull. What a wonderful tale. A Barbara Cartland themed restaurant, what fun. How on earth did we miss it. Apparently La Mirage is still there in all its pink glory. It is also on the same street (Dunrobin) as the restaurant we visited Thyme and Plaice. So we walked right past it. We shall have to pop in there for a look one day. Good excuse to go back. As far as I am aware Barbara Carltand lived most of her adult life in Hertfordshire in the former home of Beatrix Potter. However when young she was married to Alexander George McCorquodale (Hence the Princess Diana connection. Barbara's daughter was step mum to Diana, so Barbara was Diana's step grandmother) whom was Scottish so maybe she lived there in her early life. Barbara later divorced Alexander and married his cousin amongst a bit of a scandal. All very pink ruffle.